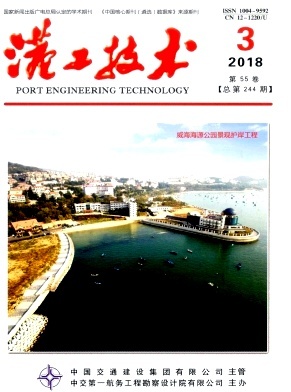 Thought about Present Situation and Development of Ports in Sanshui Area Wang Kun;Guangdong Province Planning & Design Institute for Water Transportation Co.
Study on Structural Calculation Method of Buried Culvert for Water Intake and Drainage in a Nuclear Power Plant Liu Yi;Liu Hanhan;CCCC-FHDI Engineering Co. Discussion on Design of 110 kV Port Substation Zhang Hui;Zhang Shuyuan;Zhang Jingyue;CCCC First Harbor Consultants Co. Analysis on Deformation Properties of Pile Cluster under Horizontal and Vertical Loads Wang Jingya;Feng Tingting;Shanxi Agricultural University;Survey and Design Institute of China Railway18 Bureau Group Co. The Design Methods Study of Vessel Stopping Distance Lian Shishui;Xu Hongguan;Chang Xuan;Gu Wenqiang;CCCC-FHDI Engineering Co.
Study on Cross-section Method for Calculation of Channel Dredging Amount Based on CIVIL 3D Zhao Li;Chen Yiqiang;Shanghai Waterway Engineering Design and Consulting Co. Numerical Simulation Study on Breakwater Extending Strategies for Ashdod Port in Israel Zhang Hao;Wang Kehua;CCCC-FHDI Engineering Co. Application of Ansys Workbench in Hoisting Process of Semi-circular Structure Huang Kai;Wei Zhenxing;CCCC Shanghai Waterway Engineering Design and Consulting Co.
Displacement Analysis and Countermeasures of A Coastal Berth Structure Fu Ouyang;Xiang Yulue;Guo Shengchang;CCCC Shanghai Waterway Engineering Design and Consulting Co. Application of BIM Technique in Inland Bulk Cargo Terminal within A Mountain Area Xu Tian;CCCC Second Harbor Consultants Co. Discussions on Softening Problem of Cohesive Soil Foundation for Underwater Foundation Trench Wang Qiang;Luo Xinhua;Cai Zeming;CCCC-FHDI Engineering Co.
Study on Layout of Associated Berth Line of a Large Refinery Project Deng Xuan;Yang Jia'nan;Zhou Ye;CCCC-FHDI Engineering Co.
Research on Test Techniques of Lateral Friction Resistance of Extra-long Steel Tubular Pile with Large Diameter Chen Lipeng;Wang Jian;Wang Zhan;Liu Meimei;CCCC Fourth Harbor Engineering Institute Co.
Research on Improvement of Bearing Capacity of Driven Open Steel Tubular Pile in Large-diameter Sun Yi;Sun Ying;CCCC-FHDI Engineering Co. Application of BIM in Dredging Works Chen Yiqiang;Cao Lei;Wang Fei;Shanghai Waterway Engineering Design and Consulting Co. Analysis of Site Selection Factors of Radar Station in VTS System Liu Guijuan;Zhang Jingyue;CCCC First Harbor Consultants Co. Application of Intelligent Monitoring and Controlling System of Refrigerated Container in Automated Terminal Xu Zhaoxiang;Xu Enming;CCCC Third Harbor Consultants Co.
Economic Analysis of Shore Power Techniques Based on Government Subsidy Policy Li Yong;Zhang Xu;Lin Zhaohua;Xu Kunpeng;Wu Xin'gang;Ding Chao;State Grid Zhejiang Electric Energy Saving Service Co.
Study on Fender Design Method Applied in Overseas Port Projects Based on PIANC Ding Jianjun;Li Shaobin;Lu Shengjun;CCCC-FHDI Engineering Co. Analysis of Internal Force Calculation of Lock Chamber Bottom Plate Based on Construction Procedure Liu Jianglin;Wang ping;Chen Enwang;CCCC Second Harbor Consultants Co.
Space Numerical Simulation Analysis of Steel–sheet-pile Cofferdam by Using PLAXIS 3D Lin Chen'anpan;Sun Yi;CCCC-FHDI Engineering Co.